The wine is bold, rich and textured but not over the top - it remains wonderfully restrained and focused. 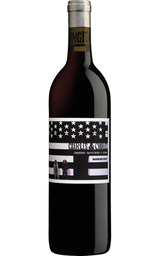 Aromas of black cherry, blackberry, and earthy, savory notes of tobacco and herbs, vanilla, and cocoa. A full mouthfeel with a long and supple finish. It's an intense dark blue/purple in color with tremendous purity, depth, and focus. Tannins are elegant, and refined. Plump and boisterous, with appealing notes of black cherry, bittersweet chocolate and espresso. Drink now through 2019. 100,000 cases made.